Its Neil Bloomer here. You kindly helped me a few weeks ago when I first set up my Roon / Naim Uniti Nova combo. I have added a Naim Uniti Core and was searching for advice on how to possibly link the Uniti Core with Roon. Roon Core and Control are via a MacBook Pro and iPad and all devices other those two are wired to my router. I tried to follow this thread but hoped you might help me understand better. Thank you. To make sure I understand, your Roon Core is on a MacBook pro which is wifi connected to the rest of the network; you have added a Uniti Core which will store some music and is connected via wire; and you want to play the music on the Core through Roon. Thank you Daniel. Please forgive my ignorance but does it mean I have to choose my Uniti Core as my Roon Core rather than my MacBook Pro if I choose to use the Uniti Core as storage under “settings”. If I have got that wrong I obviously need more assistance in configuring the devices. No you can’t run Roon core on a Naim Uniti core. The Uniti core can only be used as storage in Roon much like a NAS so it will add any file on it that you ripped or copied to Roons library. When you initially set up Roon core you would have given it a path to your music? The Uniti core makes the music stored on it available using the samba filesystem It’s this samba path that you need to enter into the Roon core as the path to you media in Storage. It won’t automatically see it as its not advertised like a normal NAS would. So you go in the storage part of settings and manually add the file path as it shows in the instructions above. It would start with the Uniti Cores’ ip address followed by the shared directory path so as an example of how that might look is 192.168.1.10/music how its structured for the Uniti core I have no idea as I don’t have one and Naims documentation is just woefully. Perhaps asking on Nains forum would help here. I know others on here have struggled to get Roon to see it though so search on here for those threads. Thank you Simon. I will do as you advise regarding researching the topic a lot more before I do anything, I don’t want to mess up my existing system. 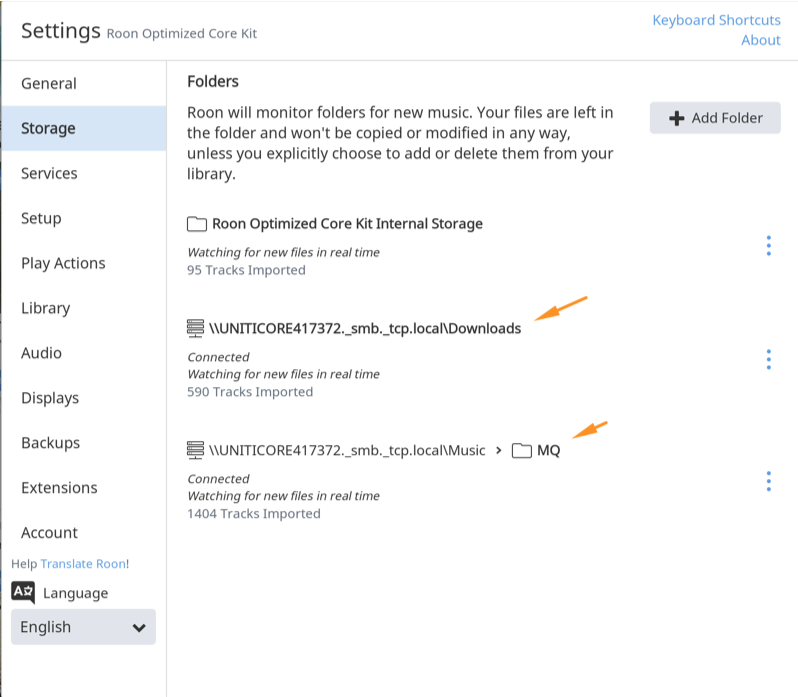 Storage locations for Roon are just where the music files you want to play are stored. Nothing to do with what machine RoonServer is running on. Storage can be local to the machine, like a hard drive, or another storage unit on the network, like a NAS. When you play a song in Roon, the music is transferred from the storage location to the RoonServer, Processed, and then sent back out to the music playing endpoint. Please keep in mind that if your RoonServer machine is on wireless, that can cause a lot of stress on the WiFi connection as you are doubling the amount of data sent in /out of the machine; which can lead to things like drop-outs, stuttering, etc, if your wireless network is not robust enough. If you do experience that, you might need to attach a network cable to your MacBook. Thank you Daniel. These threads are a great source of advice for a novice to using the devices. You and Simon have given me valuable information to explore the Roon / Uniti Core link. I will proceed with caution along the line suggested and come back if anything arises I need to follow up. I am grateful to you both. No Problem, Neil. Feel free to ask if you have questions, need help, etc etc. I am currently stuck in the connect Roon to Naim UnitiCore quagmire. I have purchased a Roon Nucleus Plus which is up and running accessing Flac files from a back up drive previously used with a ZoneRipper from Ripcaster in the U.K.The ZoneRipper crashed after a thunderstorm and before that I had endless problems with a RipNas from Illustrate.So the Naim/Roon system is my third and final attempt at computer audio. When my local hifi dealer tried to add the Naim UnitiCore it wasn’t possible to get Roon to see it on my network. I found this thread the same afternoon and sure enough Windows 10 had SMB files unenabled and set to dis-enable after a certain period.I’m hoping this piece of knowledge will prove to be the solution to the problem. The dealer is due to try again next week following further research at the shop. Both Naim and the Roon importer in the U.K. were unable to help on the day. The good news is that the Nucleus hooked up to my Squeezebox Transporter and Touch’s very smoothly and have performed well in the subsequent week or so. The discussion above leaves me reasonably optimistic that the UnitiCore will join hands with Roon and settle in well together. The other problem we encountered was that the Roon App would not load on my iPad because Apple won’t allow it to run the later operating system required by Roon.I put Roon on my iPhone to get round this but will need to purchase a later iPad to enhance the experience. Also have a problem with mains interference through my Trendnet powerline adapter into the speakers which means installing Ethernet cabling from router to study. So the whole project is way more complicated than traditional hifi but I can see the potential for a happy outcome. How are you networking it all together. These issues are largely down to network config. If your using power lines then I would say that is likely the route of the problem. Naim kit really doesn’t like them much and Roon don’t recommend them either either. If you have no choice choosing the av500/600 range may cut down on the interference. I used to have them before a decent wireless and wired setup and the av1200 caused loads of noise. Also found using a Tacima power conditioner strip helped remove anything from the av500/600. But your better not using them at all. Double check that your Naim core and Nucleus are in the same ip range . E.g 192.168.1.2 pay attention to the 3 set of numbers if it’s different then for some reason it’s on a different subnet, you need to get them on both. Can you access the Naim cores music drive by SMB on any other computer? Thanks Simon.It is a 1200 powerline that’s causing interference.I’m installing an Ethernet cable direct from the router to the Nucleus,UnitiCore and Squeezebox Transporter. The Powerlines in the other rooms are 500’s which are working fine. I think is it’s Windows 10 that’s preventing the Nucleus linking up with the UnitiCore. The dealer is having another go this week. Your suggestion regarding the poweline adapter was correct.The dealer connected a long Ethernet cable direct from the router to the UnitiCore and all worked well. Connecting up again to the Trendnet 1200 caused it to lose connection again. Next week I’m having a cable routed from the router to a Netgear unmanaged switch with gigabit ports to connect to the Nucleus,UnitiCore and Squeezebox Transporter to hopefully get things running smoothly and without the electrical interference. Should be up and running next week. Also purchased an up to date iPad today so that I can run the Roon App.It’s much nicer than on an iPhone. \Music is where the Uniti Core stores its ripped CDs. You are supposed to treat this as read only. If you need to edit the metadata, you should only do so using the Naim IOS or Android app. Adding an album is intended to be quick and easy. With relatively recent CDs, you insert the CD, wait a minute or two for it to pop out and then start listening. \Downloads is where you save your downloaded music files. For these albums and tracks you are responsible for the metadata and artwork. Initially, I hosted Roon Core on an iMac. Unfortunately I can’t remember how I added the Uniti Core shared folders to Roon Core, but it wasn’t difficult. When I migrated to ROCK, they were added automatically when I restored from the iMac Roon Database Backup. One of the reasons I moved to ROCK was that while Roon Core on iMac worked perfectly, the iMac is on Wi-Fi and it seemed silly to be pulling music from the Uniti Core and sending back to the end point (a Naim Uniti Nova) via Wi-Fi. The ROCK NUC is connected to the same Ethernet switch as the Uniti Core and Nova. My usage of Roon based on a Naim Uniti Core is so far based entirely with ripped Redbook CDs. In other words, the only music folder Roon needs to find is \Music > MQ. If and when I buy some downloaded music, I guess that it will show up as you say under \Downloads. I will probably go that way in due course. However, I have to say that Roon regularly (about once a week, and certainly after anything has been turned off) loses access to \Music > MQ on the Naim Core. I have to restart devices – typically the PC running Roon Core + Naim Uniti Core but sometimes the wifi satellites too. Even then it doesn’t always reconnect - maybe it’s order-dependent for switching on? There are two of the satellites, one in the main music room where the two Cores are plugged into it via Ethernet, and one in a bedroom which is where my Roon end-point (a SOtM sMS-200, ethernet in) is located. Perhaps some of the problem is that the two satellites are “only” connected to each other by wifi - but I’m not sure why an end-point should influence whether the Roon Core can communicate with a Naim Core, both plugged into the same satellite. The frequent need to restart devices is a bore, worsened by the twee little messages that Roon uses to say that it has failed (“You haven’t added any music yet”. Who dreams up this stuff?!). I have been on this thread earlier regarding using my Naim Uniti Core as storage for access by Roon to play on my Naim Uniti Nova. I use a MacBook & iPad to control Roon and the Core & Nova are wired to my router. All the equipment is at the same location in the house. I have tried to follow the process from comments above, but would appreciate a step by step explanation if you could help me please before I attempt it. Could you explain what your problem is - which devices don’t connect? Within Roon, you need to identify the path to the Naim Core’s relevant storage (\Music > MQ, or wherever your material is), and the software should then recognise the store. Then you need to get Roon to recognise your end-point (“Audio Device”) - see in Settings\Audio where it should show up. If you don’t have both of these, either Roon won’t know where to find the music or it won’t know where to send it. I and some of the other contributors above (Rugby, CrystalGypsy…) believe that Roon won’t reliably operate if there is any wifi in the chain - probably as a result of hiccups with RAAT as a transport mechanism? From what you’ve described here and last year, in fact, you should be mostly there, since most of your system is wired. In sum, if there’s a link that your system (Naim Core => Roon Core => Roon endpoint) which isn’t complete, then you just won’t get anything out. Roon works consistently for some people, probably the majority. It fails completely for some people (who’d know? They’ve not come onto this forum, or have abandoned hope of getting it to work). And there are some like me where it works, but inconsistently. Pity: it sounds good when it does actually function! Thank you for your detailed comments. The basic problem is my ignorance, in that I don’t understand how to specify the path to the Naim Core’s storage which is the SSD disk I installed in the Core. Any simple guidance would be helpful. You should be able to try connecting to your core via your desktop first to work out which methods workss best. Exactly what I needed, many thanks.